Always where safety glasses when shooting ANY steel targets. Only shoot AR550 or AR500 targets purchased from manufacturers that you trust. Review the manufacturer’s web site. Who are their customers? If they are selling military targets and law enforcement targets, they most likely have the manufacturing processes in place to ensure consistent quality and safety standards. Make sure you follow the manufacturers recommended shooting distances. Challenge Target’s steel safety directions specify a minimum distance of 7 yards for handgun targets and a minimum distance of 50 yards to 100 yards for rifle targets (depending on the model). Use the right ammunition. Never use armor piercing bullets, green tip bullets, steel core bullets, or steel shot when shooting metal targets. Standard FMJ rounds are suitable for all our targets. Select targets from trusted manufacturers that are designed and extensively tested to consistently deflect bullet fragments in a safe direction. Portability and ease of set-up are also important when choosing your target. Think about where you plan to shoot. Will you leave your targets on the range? Will you be moving the targets to different locations on the range? Will you be transporting them in a passenger vehicle? One of the most common mistakes people make is buying a target that’s too heavy and immobile for their needs. We often see expensive,reactive targets buried in the back of a storage shed or garage because people get tired of moving them to and from (or on and off) the range. Top target manufacturers will list the product weights on their web site. Also consider how easy or difficult it is to break the system down for transportation or winter storage. If you decide to move forward with a steel target that utilizes a wood post, we suggest a design where the 3-1/2” dimension of the wood faces the shooter. This has yielded the best results in our extensive testing. Also, make sure the wood post is parallel to the surface of the steel plate, otherwise, bullet fragments off the steel will destroy the wood. 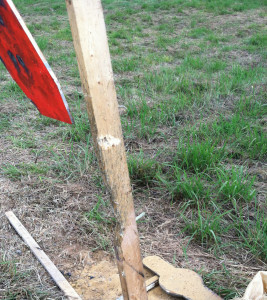 Competitor target with wood post and target plate at different angles. Fragments prematurely destroy 2×4 post. We will be writing some additional articles on this subject but for now, this should give you some things to think about when selecting your steel targets. Shooting steel is serious fun and a great way to make your experience more interactive. Pick your targets carefully from a trusted manufacturer and you will be making an investment that will last a lifetime.